An album packed with a smorgasbord of sonic styles and arrangements, Black Holes and Revelations originally sounds very modern and electronic, but deceptively finds its way to some fundamental rock and roll structure. This fourth studio album by Muse, saw the band taking a more active role in production duties along side Rich Costey, who also produced the band’s previous album. Musically, the group built upon their reputation for “space rock”, which Muse had established over their previous three albums. On the lyrical side, the themes cover such vast subjects as politics and conspiracies to alien invasions, with a few songs reverting to conventional topics. The roots of Muse date back to the early 1990s when guitarist and vocalist Matthew Bellamy joined up with drummer Dominic Howard in the band Carnage Mayhem. A mutual friend, Christopher Wolstenholme was asked to join in on bass guitar and the trio decided early on to compose their own songs rather than just playing covers. Adopting the name Muse in the mid nineties, the group slowly acquired a following over the course of several years and released their self-titled EP in 1998. The following year, Muse signed with Maverick Records and the group released three LPs from 1999 through 2003, with each gaining more popularity to the point where the third album, Absolution, debuted at number one in the UK. the band spent time in an old château in France to come up with material for a follow-up. Ultimately, Black Holes and Revelations was recorded in several locations on two continents over several months in late 2005. With an intense synth intro that sets the tension for the album, Bellamy’s voice hangs over the keyboard bedding and expertly follows the chord changes through the intro of “Take a Bow”. The full arrangemet with potent electric guitars finally arrives about 2/3 of the way through the tune, which seems custom made for large arena concerts. “Starlight” is a much more pop/dance oriented track with lighter subject matter than the opener. Beat-driven with good melody and vocals, the song was a Top 20 hit in the UK. “Starlight” is the album’s default title song with the refrain; “our hopes and expectations, black holes and revelations”, which Bellamy wrote about the feast or famine of the songwriting process. “Supermassive Black Hole” has strong 1980’s dance-oriented elements with strong influence from Prince and INXS. While it creeps dangerously close to pure dance music, the song is solid and entertaining throughout and became the highest charting single to date for Muse, reaching #4. “Map of the Problematique” is not quite as impressive as the previous tracks on the album, but is a solid piece of space-rock nonetheless. By contrast, “Soldier’s Poem” is one of the most interesting songs on the album, as a ballad with rich harmonies, reminiscent of those from Queen. It is set up like a light lover’s ballad with the simplest of musical phrases and brushed drums, while lyrically a slightly political song about justice and freedom. Coming in like a deep Pink Floyd piece with deep synths, sustained guitar notes, and rolling drums by Howard the song develops into an inspirational love song which moves through some interesting arrangements along the way. “Assassin” is like a heavy metal song performed on synths, with intense rudimental riffs and strong drum fills, while “Exo-Politics” is a stomping track with choppy riff and a saw-inspired synth and solid bass by Wolstenholme. This latter song contains the most direct rock sounds on the album, including a good guitar lead by Bellamy, which may slightly mimic the Brian may style. The final stretch contains three final songs of great musical diversity. “City of Delusion” starts with fast-strummed acoustic, making for very bright music. But this is strongly contrasted with deep and somber vocals for an overall unique effect. When the song fully kicks in, it is back to hard rock with electric guitars and some high strings in the background and a cool synth and scratch guitar under a later verse. The acoustic returns for a closing, Mexican-style trumpet lead by guest Marco Brioschi. “Hoodoo” contains surfer-style guitar with deep echo under a lounge jazz melody. The tune is very mellow to the point of not being able to decipher vocals very well. The closer “Knights of Cydonia” starts with trampling horses masked in deep synth effects. It takes nearly two and a half minutes before the rebel-based lyrics kick in for the overall prog-rock inspired track, which reached the Top 10 on both sides of the Atlantic. 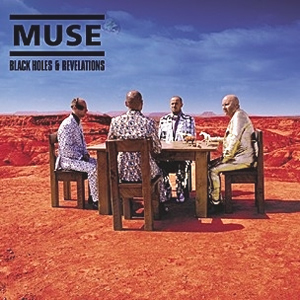 Black Holes and Revelations became Muse’s first hit album in the US and went double platinum in the UK within six months of its release. The group went on more extensive tours before finally releasing their follow-up album, The Resistance in 2009.